Until the early 1990s, pickup trucks were utilitarian vehicles used by people to haul things and drive through less-than-glamorous areas. But then Ford and GM decided they could be sporty as well. GM introduced the 454SS in 1990 and the GMC Syclone followed the next year. Dodge offered a Shelby Dakota. Not wanting to be left out of this strange new game, Ford’s Special Vehicle Team stepped up to the plate in 1993 with the Lightning. The first generation of the Lightning was made between 1993 and 1995 with 11,563 built. It has a 5.8-liter V8 making 240 horsepower. And it looked pretty much like a standard F-150, but with a few giveaway touches like sporty wheels, painted grille, and, on this particular truck, an exhaust exit in front of the rear tires. The second generation Lightning would be even more extreme and sporty and you see them quite a bit more than these. Chevy 454SS trucks show up at auction almost regularly – but they always seem like just another used pickup. However, this Lightning looks pretty nice and it is rarer than its bow-tie competitor. It would be a lot of fun, just don’t ruin it by hauling stuff. For more information click here and to see the rest of the Salmon Brothers Collection, click here. 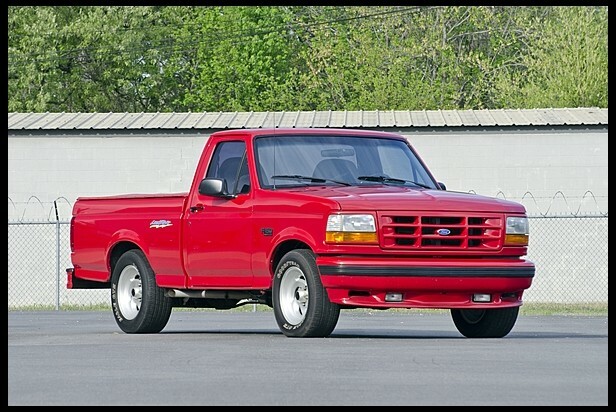 This entry was posted in Uncategorized and tagged 1993, auctions, ford, lightning, mecum, pickup, svt by classiccarweekly. Bookmark the permalink.